(Haliburton, Thomas Chandler). The Letter-Bag of the Great Western,; Or, Life in a Steamer. By the author of "The Sayings and Doings of Samuel Slick." London, Bentley, 1853. XXIII, 238pp. Orig. blind-stamped cloth, gilt. Library-stamp to title-page and first and last text page. Minor foxing. A nice copy. Orig. blind-stamped cloth, gilt. (Haliburton, Thomas Chandler). The Clockmaker; Or, the Sayings and Doings of Samuel Slick of Slickville. 2 vols. London, Bentley, 1838. XII, 329pp; IV, 354pp. Contemp. half calf, gilt, with marbled endpapers and edges. Spine and corners rubbed. Paper browned and occasionally with foxing else very good. Contemp. 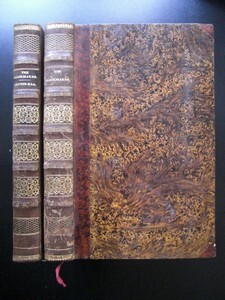 half calf, gilt, with marbled endpapers and edges. (Haliburton, Thomas Chandler). The Americans at Home; Or, Byeways, Backwoods, and Prairies. Edited by the author of "Sam Slick." London, Hurst and Blackett, 1854. 3 vols. XII, 302; VII, 314; VII, 351pp. Contemp. half calf with two labels, richly gilt. Sabin 29680. - New edition (first published 1843) of this collection of humorous anecdotes of rural and pioneer America. - Heads of spines a bit bumped. Endpapers foxed. Library stamp to title-pages and first and last text leaves. Otherwise a very good set. Contemp. half calf with two labels, richly gilt. 3 vols. HALIBURTON, THOMAS CHANDLER: The Clockmaker or the Saying and Doings of Sam. Slick, of Slickville. 2 Volumes. (1.Vol: To which is added, the Bubbles of Canada // 2.Vol: A New Series. To which is added the Letter-bag of the great western or Life in a steamer). First /1./ Edition Paris, Baudry's European Library, 1839, 1841. VI, 421 pages // VI, 474 pages. Half leather with leather edges. In good condition. With bandlet. Marbled paste-down and binding. Gilt stamped spine. Coloured resp. marbled cutting. Strongly foxed. Haliburton, Thomas Chandler. The Clockmaker; or The Sayings and Doings of Samuel Slick, of Slickville. Third Series. London, Richard Bentley, 1840. 21 cm; 8ºAntikbuch24-SchnellhilfeOktav = Höhe des Buchrücken 18,5-22,5 cm. 309 Seiten, 5 Tafeln nach Stichen, im Rohschnitt. Geprägter Kalikoeinband mit goldgeprägtem Rückenkurztitel. Der Einband begriffen, altersschmutzig, lichgilbig. Die Lagenkanten staubig, Besitzerstempel, innen ganz gut.